to watch the process in its entirety and make sure you have your SOUND ON for the full effect with the incredible Lindsey Stirling’s “Crystallize”. 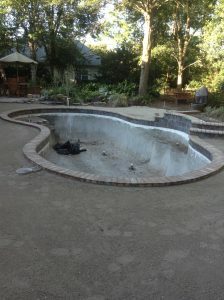 Putting a pool in is certainly a process that takes several weeks from the first dig to the first dip. 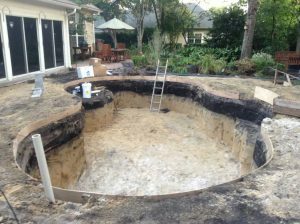 Here is a step by step process of what to expect… when you’re expecting a pool! First of all, you’ll need to have a survey done to see if you can even fit a pool in your yard. Easements with the city, county, utilities, and even your neighbor can also put a cramp in your pool design style. Make sure you verify that your city/county doesn’t have any impermeable restrictions or other pool limiting regulations as well. 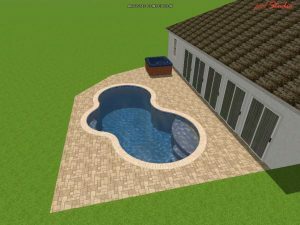 Next you’ll want to meet with a pool company ( I suggest meeting with a few) to figure out the design, price, and amenities your pool will have. I CANNOT STRESS ENOUGH THAT THE LEAST EXPENSIVE OPTION IS NOT ALWAYS THE BEST OPTION! I’ve heard too many horror stories of folks that went with a company because they were the most cost effective with the quickest turnaround, and were deeply disappointed in the end result. Do your due diligence to make sure you are matched with a properly licensed and insured company that fits your needs, even if it costs a little extra. A lot of communities have HOAs (Homeowner’s Associations) that will require prior approval of your plans before you can start building. They’ll generally need copies of the proposed plans from the contractor to approve you. 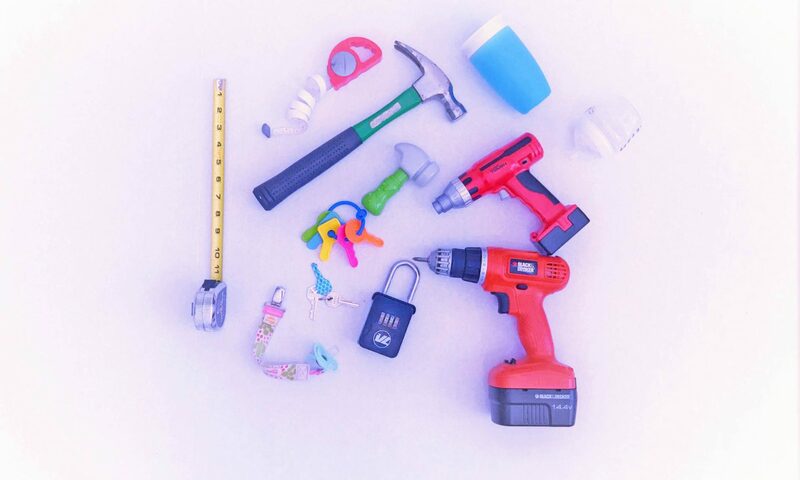 Once you’ve gotten all the paperwork squared away, the fun can begin! Obviously, they’re going to dig a really big hole. They’ve also got to level the surrounding area and smooth and shape the inside. 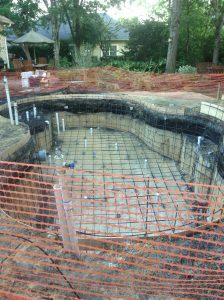 Next, they’ll add in drainage, piping, and any electrical. Then they’ll rebar the structure for support and to get it ready to shoot with the cement. This pool has an in-floor cleaning system so there are additional pipes needed for that. 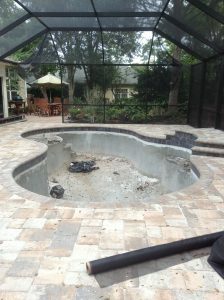 Once the cement has set, they’ll begin to add decorative tiles to the perimeter. Fun fact: the tiles you choose can have a significant effect on the water color. The marcite color comes into play as well, but the clear water directly reflects off the tile and gives off a specific “color”. 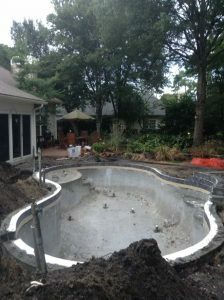 After leveling the surrounding area again, the installation of the perimeter coping material can take place. 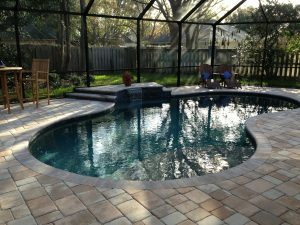 Most commonly used are pavers and cool decking, or a combination of the two. 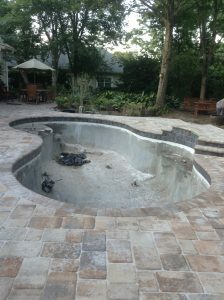 This pool will have an all paver deck. Now its time for a screen enclosure (if desired). Screens can surprisingly cool down the enclosed area nearly 3′. They also are incredibly efficient at keeping bugs/leaves/etc out of your pool. I highly recommend getting a “no-see-um” screen, which is woven to specifically keep out those tiny little gnats that always seem to attack you when you’re outside at night (especially in the South!). 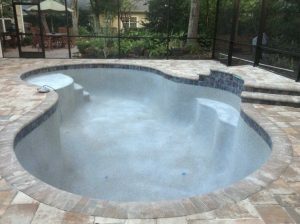 One of the final steps is to install the pool flooring. This one has a blue pebble marcite, which as mentioned earlier, will help to contribute to the color of the water. The owners were going for a tropical turquoise look. Voilà! Paradise found. All that is needed now is your favorite float (mine is the SwimWays Spring Float Recliner, X-Large ) and a good book (currently reading Whiskey in a Teacup: What Growing Up in the South Taught Me About Life, Love, and Baking Biscuits by Reese Witherspoon)! This final project includes a sundeck with umbrella holder and cascading stairs, fountain water feature with bench, in-floor cleaning system, full screen enclosure, and color changing lighting. 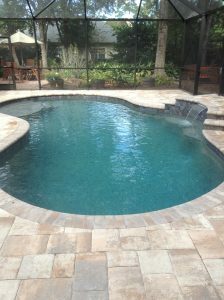 What would your dream pool look like? Next PostNext Ditch the Dining Room and Opt for Office?